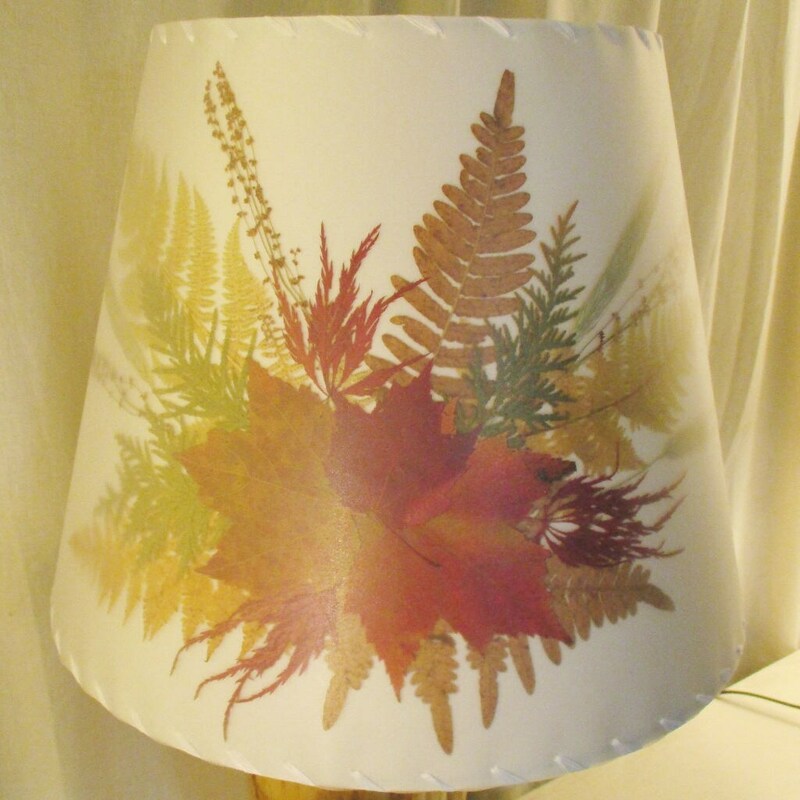 Real New Hampshire ferns, colorful fall leaves and grasses are pressed and dried for this autumn tones lamp shade. Green and gold ferns radiate from a red sugar maple leaf center, with wheat grass, cedar and sorrell accents. Bring a touch of nature inside to enjoy and inspire year round with a genuine Botanical Lampshade. When lit, your lampshade comes alive with color and a brings a peaceful woodsy feeling. This shade is available in a white or tan parchment. The last three photos show this shade in the tan color. The size shown is 9" top diameter x 14" bottom diameter x 11" height and it has a washer top for your lamp with a harp. This design is also available in other custom sizes. Please see the drop down list for sizes, and read my policies on lamp shades before purchasing. There are NO RETURNS on custom made lampshades. Your shade will look similar but not exactly the same as plant materials will vary in size, shape and color. 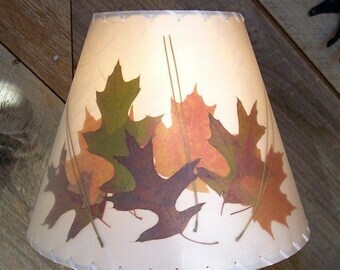 If you have ideas for a lampshade, I have hundreds of plant varieties to work with. Botanical Lampshades have been made in Sandwich, New Hampshire since 1950 and are made with the highest quality materials for many years of use and enjoyment. The plants are pressed and secured in between a styrene backing and a clear film. These shades are easily cleaned with a damp cloth for decades of use. The log lamp is not included but I do have some bases available, sold separately.